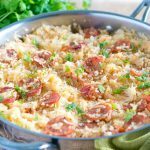 One pot sauerkraut and sausage with rice – an easy one-pan meal that’s warm, comforting and a family favorite! If you have been following my cooking creations for a while, you probably already know that I love easy and quick one-pot meals. This is another favorite go-to recipe of mine that i love and make often when I am short on time. Sauerkraut and sausage is a traditional German meal, and it reminds me of my college years in Germany. I decided to add a little twist to it by adding rice and few vegetables. It is so delicious and flavorful! Even my husband who doesn’t like to eat sauerkraut by itself loves this dish. I usually use this brand sauerkraut and am very happy with its taste and texture. This recipe makes about 4 – 6 serving sizes depending on your appetite. 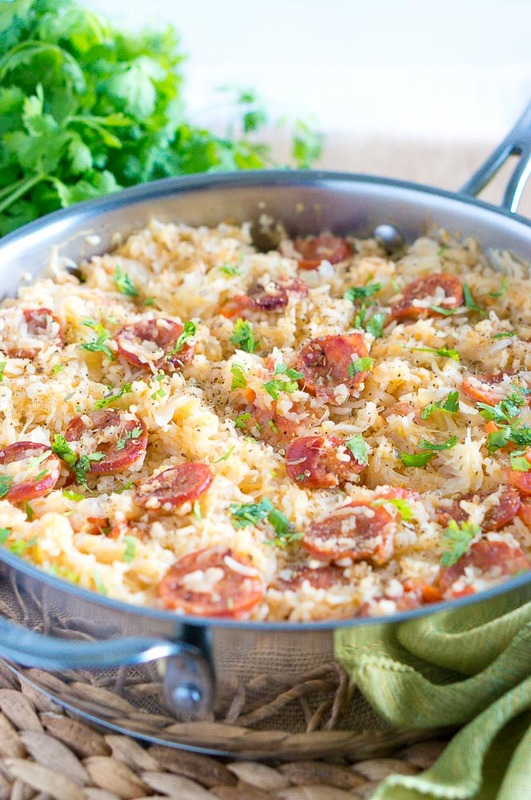 It also refrigerates well for several days – I like to make a large skillet of this one pot sauerkraut and sausage with rice and have the leftovers for lunch the next day. You can also substitute cabbage for the sauerkraut and cook it in the beginning with the onion, garlic, and carrots. Happy cooking! What is your favorite way to eat sauerkraut or cabbage? Heat 1 Tbsp olive oil over medium-high heat, and cook sliced sausage rounds for a few minutes on both sides. Transfer to a plate. Heat the remaining 2 Tbsp olive oil on medium-high, and add the chopped onion, garlic, and carrot. Season with salt, pepper and oregano. Cook until vegetables are tender, and stir occasionally. 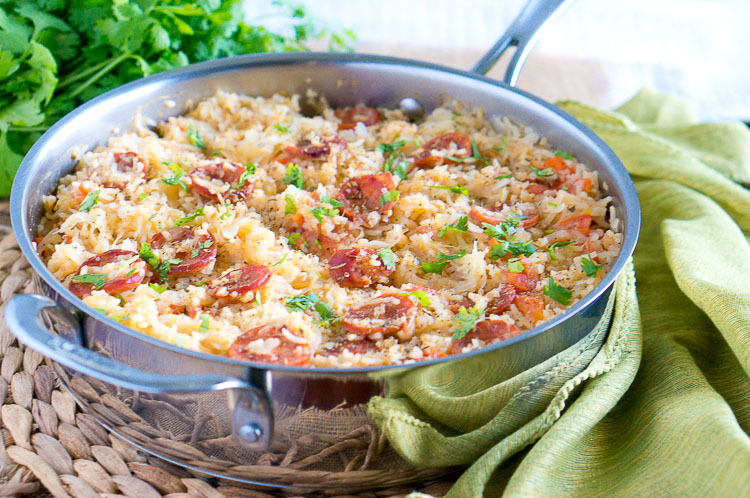 Add chicken stock to the skillet, rice and chopped tomato. Cook rice mixture according to package instructions for the rice. Bring to a boil, stir again, then cover and simmer on low heat until liquid has evaporated and rice is cooked. Add sauerkraut to the skillet and stir. Serve warm. 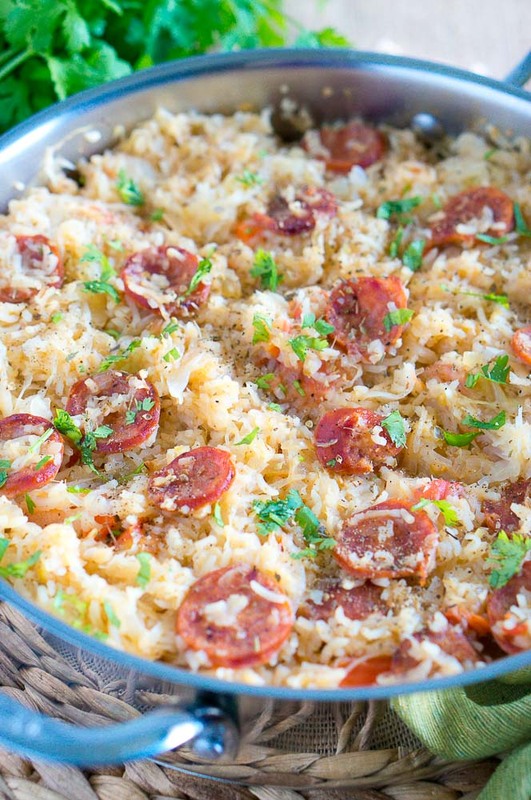 Comforting one pot sauerkraut and sausage with rice – an easy one-pan meal that’s warm, comforting and a family favorite! Heat the remaining 2 Tbsp olive oil on medium-high, and add the chopped onion, garlic, and carrot. Season with salt, pepper, and oregano. Cook until vegetables are tender, and stir occasionally. Wow, your pictures are amazing, they really do make this recipe look delicious. I like my sauerkraut fresh and not cooked, however, so I’ll probably add it to my dish when serving instead of in the pot. Thanks for sharing, can’t wait to try this at home!